In a new Puddles of Myself series, Matt Domino looks at an NBA roster from a given year and marvels at the team's makeup. This week: the memorable 2006-2007 Golden State Warriors. Editor's Note: This series, He Was On That Team?, was an idea that I came up with last year. It's really just based on a simple premise: those times when you are sitting around with your friends talking about a team you grew up watching and loving and then try to list all the players that were on said team. I have gone through this exercise countless times with my friends and it always leads to an enjoyable session of Googling players and teams, trying to remember or recapture some feeling from following a specific player or team for a year. Inevitably, you are led to some kind of surprise—finding out a player you had completely forgotten about was a key (or not so key) member of a team's roster. I admit this may only appeal to the greatest of sports fans, but it's fun and informative and, hell, I just want to do it. We start the series off with a fairly obvious pick in the 2006-2007 Golden State Warriors. The '06-'07 Warriors were one of the most exciting and endearing NBA teams in recent memory. The roster was filled with characters and they pulled off perhaps the biggest upset in NBA Playoff history when they defeated the heavily favored Dallas Mavericks in the first round. They may be an obvious pick, but I want to start this recurring feature out on the right foot and I couldn't think of a better way to do it. The way this series will work is that I will first present the roster and then wax poetic (as is my wont) about the players on the team, what it was like watching them at the time, and then where the players are now or what ended up happening to them. Sound good? Let's do it. There are certain teams that you just never forget. It could be a team like the 1995-1996 Chicago Bulls that achieves such greatness that even in the moment, before time and reflection have a chance to do their work, you have an awareness that you are witnessing something historical and extraordinary. Or, in the case of a team like the 1995 Seattle Mariners, the roster is made up of player names that made up the formative years of your childhood; names like Edgar Martinez, Tino Martinez, Jay Buehner, a young Alex Rodriguez, Randy Johnson, the scowling face of manager Lou Pinella and of course the sublime ability of Ken Griffey Junior—those names and images that still rattle around your brain years after. The 2006-2007 Golden State Warriors fit closer to the mold of that Mariners team. The '06-'07 Golden State Warriors were not a team that exemplified excellence. They finished with a 42-40 record and entered the NBA Playoffs as the number eight seed in the Western Conference. However, they had a team filled with characters, players whose names were sure to stick in your head years after the fact: Jason Richardson, Al Harrington, Mickael Pietrus, Andris Biedrins, Monta Ellis, Stephen Jackon and, of course, Baron Davis. Those Warriors played an exciting, hectic, thrilling and sometimes dangerous brand of basketball. Stephen Jackson had been involved in the Malice at the Palace and retained an element of instability in the way he played and the way he carried himself. 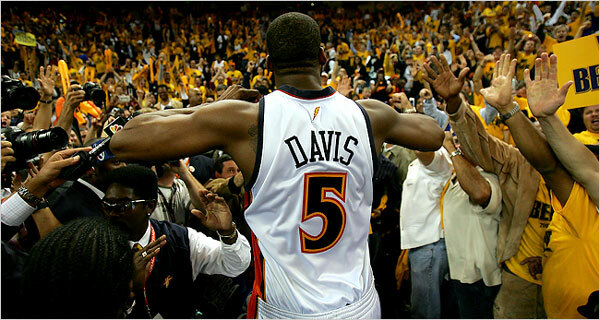 As the team's "leader," Baron Davis was charismatic and electric, capable of pushing a game's tempo to an untenable pace. As a team, they were the prime example of where the NBA was in the mid-'00's. Their roster was filled with a couple talented but unmotivated journeymen, a lot no-names, and a couple "nice" guys like Mike Dunleavy and Troy Murphy who were traded away during the season. While the Warriors were entering the NBA Playoffs, preparing to play the Dallas Mavericks as huge underdogs, I was finishing up my senior year at college. The end of college is obviously an emotional and memorable time—you try to fit as much drinking, hanging out and dramatic declarations of love in as possible because you never know who you're going to see again. And, even if you do, stay in touch, things won't be the same as they were in that little bubble of college. Most of my friends at college weren't huge NBA fans, but there were a few. So, when we were hanging out at houses at the end of the semester, playing albums, guitars and drinking games, we always had the Golden State games on. Even people who didn't like basketball could appreciate Matt Barnes' hustle and timely three pointers; could revel in Stephen Jackson's teetering menace, inspired play and competitive fire; could shout "oh!" and slap five after Baron Davis threw a long bounce pass, tossed an alley-oop to Jason Richardson, or made an acrobatic lay-up or dunk of us own. Baron had swagger, style, a big smile and that beard. The high point was obviously the Mavericks series. Dallas had Dirk, but they were a boring team. Even though they had won 67 games, it seemed as though they over achieved. No one outside of Dallas really even cared if they avenged their torturous loss to the Miami Heat in the Finals the year before. All I remember from that time is watching each and every game of the Dallas-Golden State series at my friend Miles' house, cheering on the Warriors, making jokes and drinking lots of cheap beer with all of my friends. No matter the degree of NBA fandom in the room, we all loved the Warriors and that raucous Golden State crowd. After they upset Dallas, they lost to Utah 4-1 in a tough series. However, even while watching them lose that series, we at least all got to see Baron dunk on Andre Kirlienko in one of the Top 10 posterizing dunks in the last 20 years. And that act of defiance and sheer athleticism was all we needed. We were all 21 or 22 and about to leave the friendly confines of college. It was a time, a place and a certain team. It's been over five years since that memorable spring. 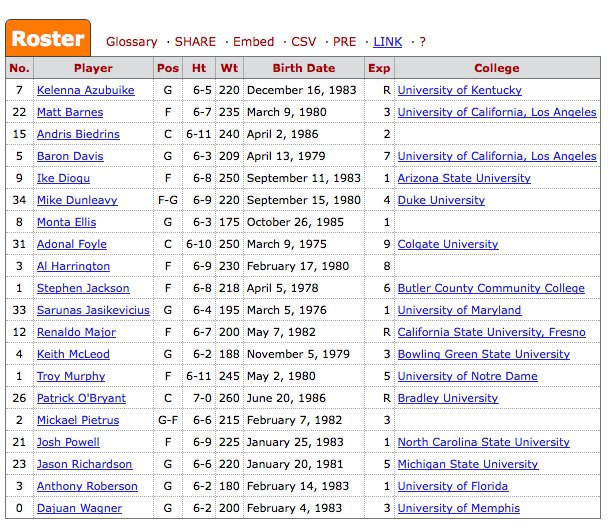 When you look at the Warriors roster from that year, you see a lot of disappointing results. First, here is a list of the players from that team who are now out of the NBA altogether: Dajuan Wagner, Anthony Roberson, Josh Powell, Patrick O'Bryant (terrible draft pick at the time), Keith McLeod, Renaldo Major (who? ), Sarunas Jasikevicius, and Adonal Foyle (due to age). Kelenna Azubuike, Ike Diogu and Mickael Pietrus played in the NBA last year but were not picked up by any NBA teams this season. That leaves the following players who are active in the NBA: Matt Barnes (Los Angeles Clippers), Andris Biedrins (Golden State Warriors), Baron Davis (New York Knicks), Mike Dunleavy (Milwaukee Bucks), Monta Ellis (Milwaukee Bucks), Al Harrington (Orlando Magic), Stephen Jackson (San Antonio Spurs), Troy Murphy (Dallas Mavericks), and Jason Richardson (Orlando Magic). There is something funny about looking at the names of all those players that are still active in the NBA. First, I had forgotten that Troy Murphy and Mike Dunleavy had started the season on the roster, but had then been traded so that the Warriors could pick up Jackson and Harringon. Though, it makes sense now because the Pacers were trying to clean house after the Malice at the Palace so they got rid of Harrington and Jackson and picked up two "nice" white players. And it was Harrington and Jackson that fit into place in the locker room and gave the team that extra swagger and toughness that helped their playoff run. But every active player has been somewhat of a disappointment. Matt Barnes translated his hustle on the Warriors into key role player status on good Orlando Magic, Los Angeles Lakers and now Los Angeles Clippers teams, but he's not much more than that. Biedrins is still on this year's young and talented Warriors team, but his employment in the NBA still remains baffling. Monta Ellis remained on Golden State until last season when he was traded to Milwaukee, but he has never been able to translate his formidable offensive skills into anything resembling an all-around or thoughtful professional game. It seems as though he is destined to remain a prime example of just another one of those NBA players that came up in the early to mid-'00's: full of offensive talent and potential, but never savvy enough or concerned enough to put that ability aside in order to become a more complete player or part of a good team. Jason Richardson found a great role as an outside shooter on the Dwight Howard Orlando Magic teams that were perennial contenders from 2009 through last season and may have a bounce back season this year on a Philadelphia 76ers team that should make the playoffs. He has transitioned nicely from his early career explosiveness on terrible teams into being comfortable as a role player on competitive teams. Stephen Jackson played well for the Warriors in the 2007-2008 season (20.1/4.4/4.1), but the Warriors missed the playoffs. Jackson was sidelined by injury in 2008-2009 and was traded to Charlotte where he led the Bobcats to their only Playoff appearance in 2010. In 2011, Jackson was traded to the Milwaukee Bucks where he underperformed and clashed with strict coach, Scott Skiles, until he was traded to the San Antonio Spurs last year. Jackson will most likely end his career with the Spurs, which is where he won an NBA title back in 2003. Something about that ending seems fitting as Jackson has always been misunderstood on most of the teams he has played for. He's an outspoken, somewhat moody player who is capable of great things on the basketball court. He has proven he can be the second or third best player on a playoff team. However, he was never understood or used better than in San Antonio, which makes sense, since only the headiness of the Popovich/Duncan mystique could reign in whatever singular energy that Stephen Jackson contains. Finally, there is Baron Davis. Davis is perhaps one of the most frustrating NBA players of all-time. He is a player who was given the physical, athletic, and basketball gifts to become one of the best point guards in the history of the game. He was bigger and stronger than an average point guard, but just as fast and had a fantastic passing ability. He wasn't afraid to take the big shot and even though he wasn't an excellent three point shooter (32%), seemed to make them when they counted. The problem is that most of the times the shots didn't matter because Baron was on bad teams, and when he was on bad teams he didn't care. So, even though Steve Nash has been quoted numerous times as saying Baron was the point guard he hated playing against the most, Baron always played carrying a little extra weight and not caring as much as he should have. After the 2006-2007 Warriors season, he played one more year in Golden State before signing a big contract with the Clippers underperformed on terrible teams. He seemed to come to life when Blake Griffin joined the team, but was traded to Cleveland where he disappeared once again. When he signed with the Knicks last year, everyone who followed the NBA thought it was the perfect fit. Baron would be playing on a team and in a city where expectations were high and basketball really mattered. However, he spent much of the season injured and had to play to get into shape. And that led to his gruesome knee injury against the Miami Heat in the playoffs last spring. I was at that game and as I watched them carry him off the court on a stretcher, I knew that Baron Davis' career probably ended on the floor at Madison Square Garden. A fitting end to a guy who wanted the spotlight, but couldn't figure out that to get there you have to give a damn. Baron Davis grew up in Los Angeles and went to college at UCLA. He is a member of SAG and is known to critique movies. For a guy who loves films so much, maybe it makes sense that he will best be remembered for being the leader of the 2006-2007 Golden State Warriors. He caught lightning in a bottle during that 2006-2007 season with Golden State. He played on a team that had an attitude and a swagger that matched his own ambition. Just like Baron, none of the players on that team were truly the same after that season. However, they pulled off one of the biggest upsets in NBA history, had a locker room full of characters and put on a run of some of the most exciting basketball in the past 20 years. There's enough in there to make a movie about. And if they do make the movie, I'll see it, because I will never forget the 2006-2007 and the effect they had on me during an important moment in my young life. Love to Spend the Night with Anna K.